Strong shaking awoke residents of Tonga when a magnitude-7.9 earthquake rocked the region at 4:26 a.m. local time today, according to the U.S. Geological Survey (USGS). Although Tonga is seismically active, seismologists say that such a large-magnitude event is unusual for the region. 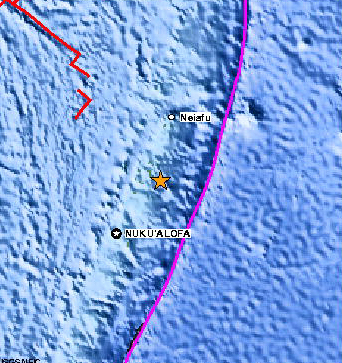 The 55-kilometer-deep quake occurred 160 kilometers south of Neiafu in Tonga, the cluster of South Pacific islands east of Australia and north of New Zealand. Image is courtesy of USGS. The Pacific Tsunami Warning Center issued a tsunami warning for the Pacific basin. The center canceled that warning after the threat had passed, however, and said that at most, some areas could see small, momentary sea-level changes. In Samoa, for example, a half-meter tsunami was reported, says David Applegate, senior science advisor for earthquake and geologic hazards at USGS in Reston, Va. So far, no reports of significant damage or injuries from the earthquake have been reported, according to USGS. And "not a lot" of local onshore damage has been reported from the ensuing small tsunami, Applegate says. Tonga lies near the Tonga Trench, where the Pacific plate is moving west and subducting beneath the Australian plate. The rate at which the plate subducts is "one of the higher rates worldwide," says Jim Dewey, a geophysicist at the USGS National Earthquake Information Center in Denver, Colo. But that plate boundary was not necessarily the source of today's earthquake, Dewey says. Seismologists have also measured faulting and stresses within the interior of the Pacific plate. "This earthquake is in a position that, based on preliminary data, I wouldn't rule out either mechanism," he says. To figure out the center of today's earthquake, seismologists will continue to analyze the data as it comes in. Stresses both in the Tonga Trench and within the Pacific plate make Tonga "very active at the moderate-earthquake level," Dewey says. Two other earthquakes over magnitude 5.0 have shaken Tonga since mid-April. Many of the region's events fall between magnitude 6 and lower magnitude 7. Within that range, Dewey says, Tonga is in one of the "most active areas on Earth." Large earthquakes in Tonga are not unheard of, however, and can't be ruled out for the region, Dewey says. Evidence exists for a few earthquakes in the 19th and early 20th centuries that approached the magnitude of today's event, he says. But today's magnitude-7.9 quake was "near the upper limit of what we know from the last century," he says.